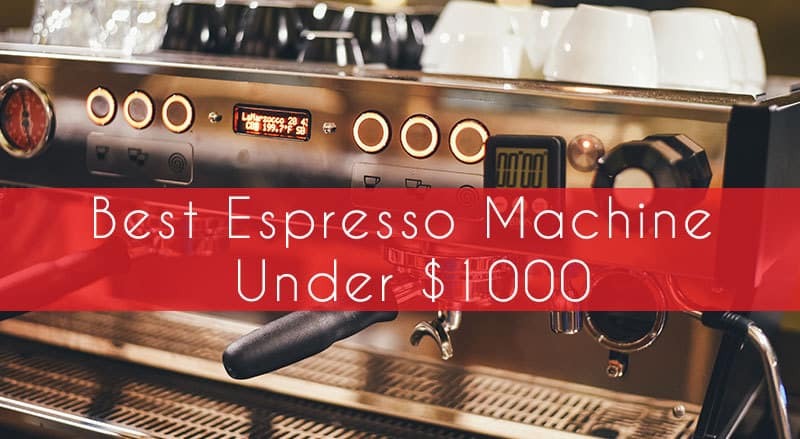 Espresso is one of the great pleasures in our world but if you want great espresso then you need to check out the best espresso machine under $1000. The home barista knows that quality is paramount when getting a fantastic shot of espresso. From the fine grind of the beans to the right temperature of the water, espresso takes work but that work is worth it when it comes together in your latte, macchiato, espresso, or ristretto. Of course, the price of these machines certainly makes them exclusive, but the finer things in life are often exclusive, and it’s why they are so enjoyable. The simple answer – espresso is unbelievably enjoyable if you already love coffee. If you like coffee but want to kick it up a notch, the logical step is indulging in espresso. On its own, a shot of espresso is quite the caffeinated drink. In fact, it boasts the highest concentration of caffeine. But that is not why you drink espresso – it is mostly about the taste and texture. This is why espresso is the base for more indulgent coffees such as caffe lattes, macchiatos, cappuccinos, café mochas, etc. Getting a great shot of espresso means that producing these types of drinks at home is easier than ever. Because of the highly-concentrated taste, espresso is one of those things where you need to figure out for yourself what your preferences are. The right espresso machine has enough flexibility for you to refine your palette while at the same time giving you subtle guidance on how to most effectively make a good shot of espresso. One purchase you should consider – porcelain espresso cups, they are the perfect accoutrement for all espressos. There is a reason why this machine is at the top of the list of anything that involves the best espresso machines, and that is because the Breville BES840XL is unbelievable in its ability to consistently produce the best shots of espresso time and time again. When you are looking for good espresso from home, this machine is so good that you will swear you have been transported to some Italian bistro. 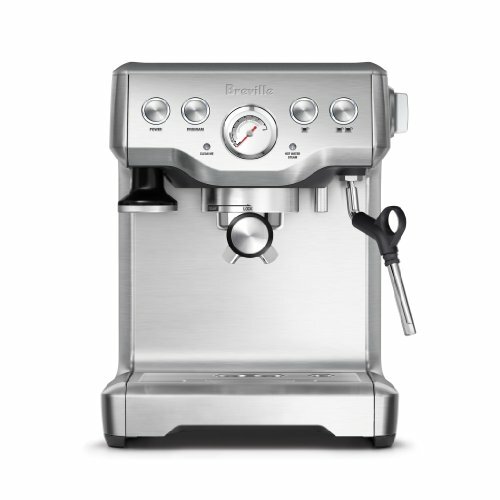 So why is the Breville considered to be the best? Well, this machine is uncanny in its consistency and that is mainly because it does an exceptional job keeping the water at the right temperature (for espresso, the ideal temperature is between 195 and 200 degrees Fahrenheit). With low water pressure at the beginning of the extraction along with easy to understand controls, you will quickly get the hang of using this particular machine for your espressos. Because the Breville has a bunch of removable parts, cleaning the machine is easy. As with any espresso machine, it is imperative to clean it so that you never have to worry about the flavor being contaminated. Breville makes it easy to remove the different attachments including the water tank and drip tray. Because they are safe for the dishwasher (provided they are on the top rack) you are not spending undue time scrubbing each attachment. The biggest problems people have with the Breville come from enormously high use. The stream rings will have a propensity to fail and some have reported problems with the pump failing after a while. However, as long as you refrain from abusing the unit and keep it cleaned and well maintained, these are issues that probably will not affect you right away, if at all. Ultimately, the Breville is the best in its class, and time after time home baristas come back to this device because of how consistently it produces the best shots of espresso. When you think of a smart looking device that can help you keep a dinner party going and keeps the guesswork out of a complex process, the Gaggia Semi-Automatic Espresso Maker is exactly what you have in mind. This device is quite stylish and allows you to keep the party going with minimal interrupts and fuss while you wait for espressos to be made. The more understated features are the materials used to make the filters. The brass with chrome plating provides an impressive consistency with keeping the temperature where it needs to be for optimal espresso making, and the cup warmer means you don’t have to worry about your espresso going cold if you have to attend to other matters. The removable tank holds an impressive amount of water and is easily refillable – no struggling with the sink hose here! There are some issues, however, with the Gaggia. For the enthusiastic home barista, there are not too many options to customize your espresso, so while you may enjoy the convenience and the look of the Gaggia, after a while you could end up being bored by doing the same old espresso pulls. A more serious issue is there have been reports of ruptures in the tubing going from the pump. This is enough of an issue that there are YouTube videos of Gaggias pouring out water. 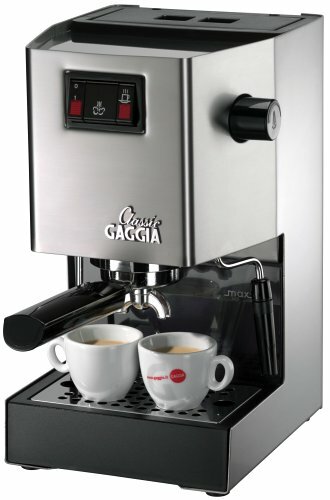 Make sure you regularly check your Gaggia to ensure that pinholes don’t become more problematic. Ultimately, despite its issues, the Gaggia is a very good way to make espresso. It takes the guesswork out of making the shots, and allows you the ability to entertain more efficiently. 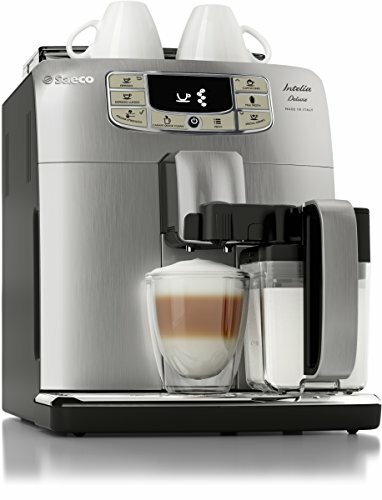 This machine is definitely on the high end of our price range but all indications are that if you love good espresso and you have the money, then this particular machine from Saeco is a worthy investment. The first thing, and most important thing, when you invest in a machine like this is making sure that the machine is reliable, and that is probably the best part of the Saeco. It can pump out espresso with ease and often. It is robotic in its consistency and makes pulling espresso shots easy for the amateur barista. In fact, one of the highest points of praise for this particular espresso machine is its ease of use. Other features people really enjoy is the oversized hopper that is perfect for the whole coffee beans. The air tight lid keeps your beans fresh and prevents air intrusion. The grinder does a fantastic job creating the smallest possible grounds while maintaining incredible consistency, and the water is always heated perfectly thanks to the electronic controls. The milk frother is also unobtrusive and provides the perfectly frothed milk that your espresso needs. The drawbacks for this machine come down to the price and the lack of an ability to make American sized drinks. Of course, if you are willing to pay nearly $1,000 for an espresso machine, you can do far worse but that being said, the price will keep some people from buying this machine, which is ultimately a loss. The other problem with this machine is that it does not make American sized drinks. Now, granted, Americans like their drinks massively sized, but still, it is who we are and not having this does take away some of the Saeco’s charm. 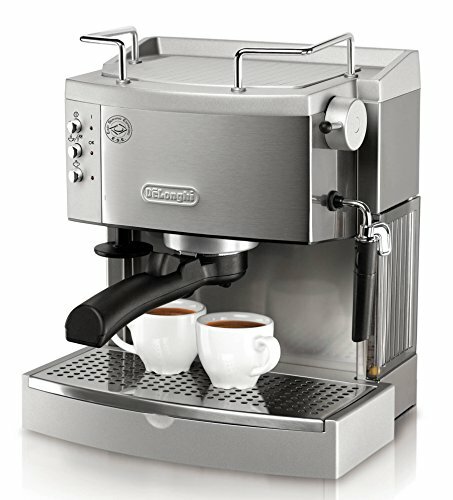 The bottom line, however, is if you are willing to spend close to a grand for an espresso machine, this one will do the job and do it quite well – even if it does not produce American sized servings! In our modern lifestyle convenience is one of the most critically important components to any endeavor. When it comes to espresso, this is no different, and having the ability to get a great espresso without endeavoring much in the way to extraneous effort is certainly part and parcel of this important consideration and why the De’Longhi EC702 delights espresso enthusiasts. Though it looks to be a very serious and complex device, the De’Longhi is actually all about simplicity. 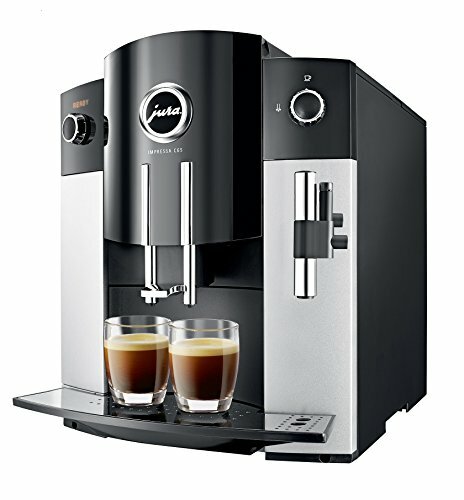 In fact, it is one of the few espresso makers that offers the capability for both ground coffee beans or the highly convenient pod systems. The best part is you suffer no lack of quality from using either system. De’Longhi engineered them to work seamlessly through their unique filter. Convenient? Heck yea! When you get to the making of the espresso, De’Longhi also takes the guesswork out of it. The device self-primes and you can enjoy their easy espresso system to make consistent pulls every time. All you have to worry about is having a cup ready for your espresso drinks. The pod system also allows you to entertain seamlessly instead of having to spend lots of time having to work the machine to please your guests. That being said, there are some issues with the De’Longhi that need to be addressed. The biggest one is durability. The De’Longhi does not last long – and this is possibly due to it being one of the lower cost espresso makers. The bottom line is there are plenty of stories of this unit failing within 18 months of purchase. Going along with that, because this unit does so much, it has lots of extra parts, and those parts tend to fail. It is not unheard of that the coffee drip function will stop working while the espresso keeps on going. This is why this unit is not necessarily recommended for people who are more enthusiastic baristas. At the end of the day, the De’Longhi is great if you need convenience and something that can do multiple things, but reliability is an issue with a budget espresso machine. They always say the future belongs to the bold and we celebrate boldness rightfully so. There is a part of being bold where you can also be brash. Perhaps naming your produces “IMPRESSA” and slapping a price tag just one penny under a thousand dollars would qualify for this distinction, but to look at the glitz of this particular espresso machine is to miss how the beauty of it is truly masked in its simplicity. Also, that simplicity could be its downfall, but why should we be such a drag so early in the review? Instead, think about this – all you need to do to get great espresso is turn a flippin’ knob! Other machines don’t make it that easy, and while the home barista is reading this review and sneering at the appreciation of the simplicity and the downplaying of the “craft”, the fact is we all love things that are easy. Other features that are fantastic are the adjustable height of the spouts and the elegant design. The Jura is a machine that is compact and sleek; it will fit in any kitchen and add a touch of class to your décor. However, now we must address some of the issues with the Jura. Besides the price, this unit is not all that durable. In fact, one could even say that for nearly a thousand dollars for it to fail as much as it does is pretty lousy. The biggest culprit is the steam arm. The steam does not get hot enough so the frothy milk that you come to expect from an espresso machine is not as frothy as it should be. Overall, the Jura has a prohibitive price tag that will dissuade a lot of people from purchasing it, but if you are looking for something that can work simply and elegantly, there are few espresso machines that make as valiant an attempt as this particular espresso machine. Making an investment in an espresso machine is not something that should be done lightly. Understand how experienced you are and find a machine that best suits your skill level. Once you do that, it is much easier to enjoy espresso and your investment in an espresso machine will be well met with lots of enjoyment that comes from the simplest of pleasures.